What is wheelchair seat width? 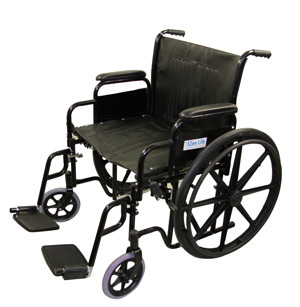 The seat width of a wheelchair is generally considered the width of the seat upholstery. When a wheelchair is referred to as a 18" wheelchair it means the width of the seat upholstery is 18" wide. Why is wheelchair seat width important? Having the correct seat width on a wheelchair is important for both comfort and function. Having the correct width of wheelchair is more important for users who spend longer hours in the wheelchair. For those who only use their wheelchair for short shopping trips or errands outside the home width is not as important. Too narrow a width will cause the arms of the wheelchair to put pressure on the outside of the hips and thighs and could potentially cause pressure sores. Too wide a width on a wheelchair will make it difficult for the user to reach the hand rims to propel the wheelchair and also prevent the wheelchair from being able to maneuver in small spaces. Standard widths for wheelchairs are 16" (narrow adult), 18" (standard adult) and 20" (wide adult). Smaller widths as narrow as 8" are available for children or really small adults and wider seat widths up to 28" and beyond are available for wider adults. Although 2" increments have always been the standard for widths of wheelchairs, most custom-made wheelchairs are available in 1" increments so it is possible to order chairs in odd sized seat widths. Originally the rule of thumb method of determining the correct seat width was to add 2" to the measured width of the user when seated at their widest point (usually the hips). The intention was to allow enough room for the user to sit comfortably while wearing a winter coat. These days most wheelchair users do not spend a lot of time outdoors in cold weather and they don't wear long coats. Wheelchair users today usually wear jackets or short coats that don't need much, if any, added seat width. The first step in determining the width needed is to have the user sit normally on a solid surface and measure their width across the widest part of their lap which is normally the hips. Some people have large thighs that, when sitting, may be wider than their hips. In this case the widest part of the thighs would be measured. It is important that this measurement is taken straight across the lap. Usually using a yardstick is a better choice than a measuring tape because there is a tendency to wrap the measuring tape around the user from hip to hip which gives too large a measurement. Removable arms on a wheelchair are mounted outside the seat frame so the seat width can be virtually the same as the width of the user. Fixed arms on a wheelchair may be mounted above the side edges of the seat and an extra 1" to 2" will need to be added to the user width. Some seating accessories such as hip guides, adductors or abductors may require additional width to the wheelchair seat. Users requiring special seating and accessories will normally have a professional of some type helping to decide the needs of the user and the specifications of the equipment.